MONTREAL, QUEBEC--(Marketwire - Aug. 7, 2009) - Yorbeau Resources, Inc. ("Yorbeau"')(TSX:YRB.A) is pleased to report that it continues to drill the Cinderella East target of its Rouyn property. Two diamond drill rigs are operating in the area where a zone of high grade gold mineralization was discovered during the Company's 2008 drilling campaign. This zone, which was penetrated by drill holes 08-CI-464 (8.1 g/t Au over 7.0 m) and 08-CI-467 (23.9 g/t Au over 4.8 m) (see press releases of September 25, 2008 and January 20, 2009), is located about 700 metres east of the historic Cinderella prospect (see accompanying drill location map, longitudinal section and target location map). Rather than focus on defining the known mineralization, the Company's exploration strategy is to carry out a program of widely-spaced drill step outs. The objective of the current drilling program is to demonstrate that the Rouyn Property has the potential to host significant additional tonnage of mineralized rock rather than extend in incremental fashion the known mineralization. While two new discoveries were made on the Property during the 2008 drilling campaign in the vicinity of the Cinderella East and Lake Gamble targets, extensive areas of the Property remain unexplored. By using a widely-spaced drilling pattern the Company is able to test more of its prospective ground in order to better evaluate the overall potential of the Property. This strategy entails greater risk with respect to any individual drill hole as it is intentionally drilled a good distance from known mineralization. To date, complete assay results from seven holes have been received, and results are pending from an additional four holes which have been completed. Results from hole 510 are considered to be significant in that the hole encountered a 17 m interval of gold-mineralized albitized dyke. While not economic, this is regarded as having considerable significance as such formations have long been associated with several large gold mines along the Cadillac Break (Kerr-Addison, Kiena, Kirkland Lake) and the Destor-Porcupine Break (Harker-Halloway, Timmins). Where mineralized, albitite can offer orebodies of relatively uniform thickness and grade. Hole 510 intersected a broad zone of gold-bearing albitized dyke, as shown in the following table. 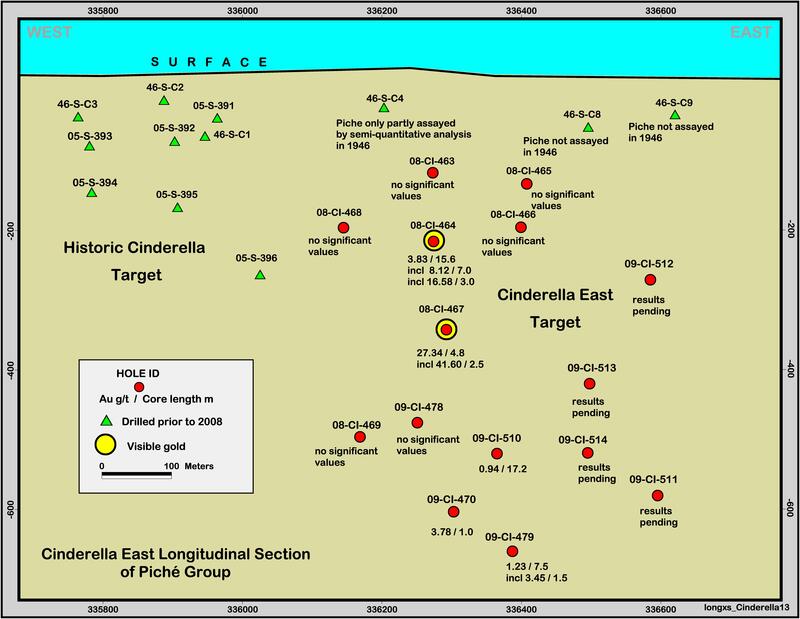 "These results are encouraging for the Cinderella East target," stated Yorbeau's President and CEO Thomas L. Robyn, "because this is the first significant intercept of a gold-mineralized albitized dyke in our drilling program. Drilling with two rigs will continue in accordance with the Company's exploration strategy." The qualified persons under National Instrument 43-101 are Thomas L. Robyn Ph.D., CPG, RPG, and Laurent Halle, P.Geo., who have reviewed and approved the content of this release. Samples are analyzed at ALS-Chemex in Val-d'Or, Quebec. All samples are analysed by standard fire assay. Samples returning more than 3 g/t are re-analyzed by fire assay with a gravimetric finish. Samples returning more than 6 g/t and those with visible gold have their rejects analysed by a metallic sieve method. Yorbeau has implemented a QA/QC program that consists of inserting blanks and gold standards in batch samples being sent to the assay laboratory. Selected pulp samples will also be re-analysed by a different laboratory. The raison d'etre of Yorbeau is to identify a world-class gold deposit in a major mining camp. Against the backdrop of a market that is steadily more welcoming for gold, Yorbeau is poised to significantly increase the known gold resources on its properties in northern Quebec.